Marco Bindi has a PhD in crop simulation modelling of forage crops and currently is full professor at the University of Florence. 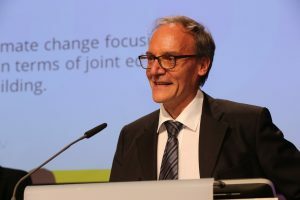 Since the 1988 he carried out research in the fields of the crop simulation model and the effect of climate change on natural and agricultural ecosystems. He has lead several national interdisciplinary projects on agrometeorology, integrated wheat production, application of remote sensing and GIS and development of simulation models. In the last 4 years he was involved in several EU funded projects on climate change impact on natural and agricultural ecosystems. He was nominated lead author of the IPCC 4th and 5th assessment reports. He was Director of the Dept. of Agronomy and Land Management of the University of Florence (2007- 2009). He is author of more than 130 papers on refereed international journals dealing with agrometeorology, crop modelling, climate change, environmental physiology (Scopus H-index = 35). He coordinated the Master on Applied Meteorology of the University of Florence (2002-2005). He is member of European Society of Agronomy and Italian Society of Agronomy. He was the chairman of Div. 2 of the European Society of Agronomy (2005-2008). Since 2015 is Vice- President for National and International Research of the University of Florence. Filippo Giorgi obtained a Ph.D. from the School of Geophysical Sciences of the Georgia Institute of Technology, Atlanta, Georgia, USA in 1986. From 1986 to 1998 he was a scientist at the National Center for Atmospheric Research (NCAR) in Boulder, Colorado, USA. Since 1998 he is at the Abdus Salam International Centre for Theoretical Physics (ICTP), Trieste, Italy, where he is the head of the Earth System Physics (ESP) section. Giorgi is an international expert in climate modeling and climate change research, with main focus on the regional scale. He authored or co-authored over 300 papers in peer-reviewed scientific journals and is included in the 2001 list of most highly cited scientists in the Geosciences (which places him in the top 0.1% of this category). 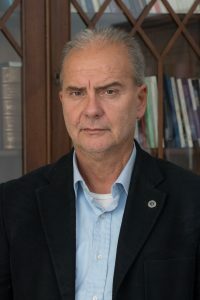 Giorgi has been on numerous international panels and committees, and from 2002 to 2008 he was one of the vice chairs of Working Group I of the Intergovernmental Panel on Climate Change (IPCC), which won the 2007 Nobel Peace Prize. In 2018 Giorgi was awarded the Alexander von Humboldt medal of the European Geosciences Union (EGU) for his outstanding contribution to regional climate research and his outreach work towards the progress of science in developing countries. Valerie Masson-Delmotte is a French climate scientist and Research Director at the French Alternative Energies and Atomic Energy Commission, where she works in the Climate and Environment Sciences Laboratory (LSCE). She uses data from past climates to test models of climate change, and has contributed to several IPCC reports. Masson-Delmotte was born 29 October 1971 to two English teachers, and she grew up in Nancy, in the north west of France. She completed a Diploma of Advanced studies in Engineering with honours at the Ecole Centrale Paris in 1993. She also received her PhD in from the same institution in 1996, in fluid physics and transfers. Her doctoral thesis was “Climate simulation of the Holocene means using general circulation models of the atmosphere; Impacts of parameterization”. After her PhD, Masson-Delmotte began working as a researcher at the Commissariat for Atomic Energy (CEA), specifically the Laboratory of Climate and the Environmental Sciences. She became head of a paleoclimate group in 2010, head of a research group in 1998, and completed her habilitation in 2004. Since 2008, she has been the Research Director/Senior Scientist at CEA. Her research includes water vapour monitoring and combines past climate variability (ice cores, tree rings) with simulations, to address current climate models. Masson-Delmotte served on numerous national and international projects including the Intergovernmental Panel on Climate Change (IPCC). In 2015, she was elected co-chair of Working Group 1 of the IPCC, which works on the physical basis of climate. She was the co-ordinating lead author of the paleoclimate chapter in IPCC AR5. Since 2014, she has been a member of the French Research Strategic Council. She has published extensively, including several books for the general public, as well as children’s books. Masson-Delmotte won the Martha T. Muse prize for contribution to Antarctic science in 2015. She also won the French-Austrian Prize Amédée in 2014 and the Irène Joliot-Curie prize for the woman scientist of the year in 2013. She won the prize of scientific excellence UVSQ in 2011, and the Descartes Prize of the European Commission for transnational collaborative research: EPICA in 2008. She was associated with the Nobel Peace Prize 2007 awarded to Al Gore and the IPCC. She was co-awarded the Grand Prix Etienne Roth du CEA from the French Academy of Sciences in 2002.